Risotto is one of my favourite foods. I love making it, adding the stock and mixing the rice in anticipation for that moment when the rice is just right; not hard but not ‘rice pudding’ soft. I also love the diversity or Risotto. You can create such great flavour combinations and experimenting is really fun. It can be a light starter or a meal in a bowl, depends on the size and creaminess. The thing is, rice isn’t one of the allowed foods on the SCD diet. I found recipes using cauliflower a rice substitute, but felt the cauli’s flavour was too strong and not to J’s taste, so I decided to try celeriac instead. Turns out, celeriac has a great savoury flavour which isn’t overpowering. It’s widely grown in the UK and seams to be in season all year round. We used it as plain rice for an indian style dish and then I decided to try making a risotto. If you have any experience in making risotto, you know that the slow cooking and mixing of the rice releases the starch in the Arborio Rice, which creates a lovely creaminess and texture. Celeriac doesn’t do that, so I had to re-think the risotto making process and decided that I will have to create a ‘sauce’ which will give the creamy, rich texture. I found that ‘sacrificing’ a small amount of the celeriac, adding olive oil and stock, and blending them to a smooth, cram-like sauce, added that ‘risotto’ texture. A knob of butter added a beautiful rich flavour and a good shine to the ‘rice’. This created a basic ‘Risotto Bianco’ and then I mixed in some pesto sauce and topped with roasted summer vegetable. Heat the oven to 190˚c and prepare a roasting pan, lined with aluminium foil. Place all your vegetables, including the garlic in a large mixing bowl, drizzle a good glug of olive oil and season with salt and herbs to taste. Mix the vegetables thoroughly to ensure they are all coated in oil, herbs and garlic. I found clean hands are best for this job. Arrange the veg on the roasting pan and roast in the oven for 35-40min, mixing occasionally to avoid burning. In a frying pan, heat the 1tbsp of olive oil and the water, the add the chopped onion, and slowly fry on medium heat until translucent but not brown. Add more water if onions start to colour. Meanwhile, place the celeriac chunks in a food processor and chop to rice-size pieces. Make sure it is all processed to the same consistency. Once the onions are cooked, add all the chopped celeriac and slowly cook on medium heat, until the celeriac is soft but not too soft (‘al-dente’ is best), then take off the heat. Scoop a 1/4 cup of the cooked celeriac and onion into a blender, add the remaining 1/4 cup of olive oil, the stock, 2 tbsp of the pesto sauce (if using), salt and pepper and blend until smooth (single cram consistency). If the mixture is too thick, add more stock. If it lacks flavour, add salt, more pesto and a garlic clove until it is to your taste. Return the pan with the fried celeriac to the heat and mix the sauce through. Add the butter and the rest of the pesto and mix again until the butter is melted. taste and adjust seasoning if needed. 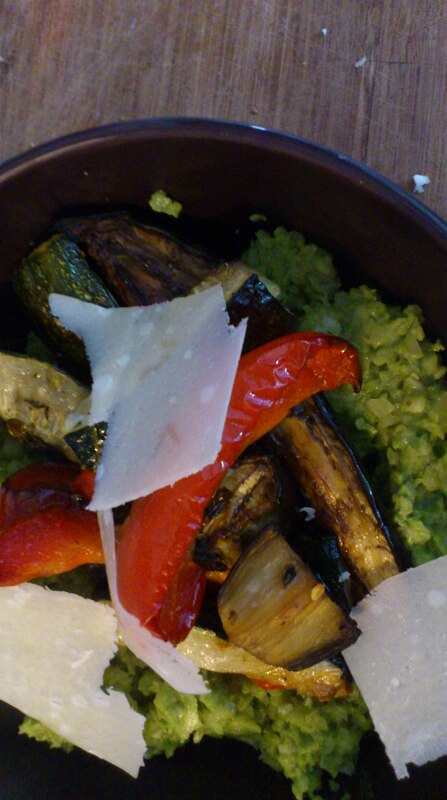 Place the risotto in a bowl, top with the roasted vegetables, a drizzle of olive oil and shavings of Parmesan cheese. Even though I know the plot of this post, it was still really interesting and well written and concise. Regardless of whether you choose/need to be on a diet like this I strongly recommend this recipe just for the taste and texture experience.